Tia Mowry is back. 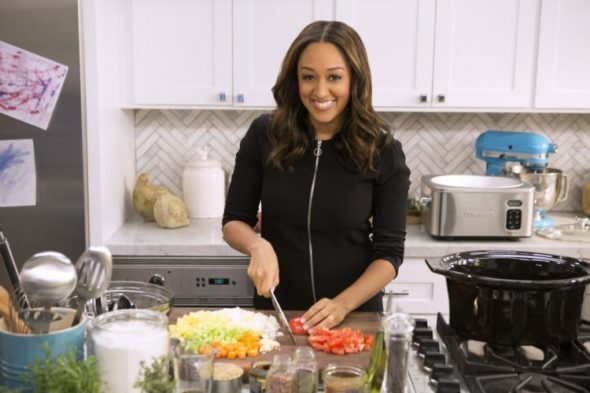 This week, Cooking Channel announced season three of Tia Mowry at Home will premiere in January. The cooking series features the former Sister, Sister star “preparing mouthwatering meals for friends and family.” The new season will features guests like Naya Rivera, Wendy Raquel Robinson, and Kelly Rowland. Season three of Tia Mowry at Home premieres on January 8th at 5:30 PT/8:30 ET. NEW YORK – December 20, 2016 – On the new season of Tia Mowry at Home, beginning on Sunday, January 8th at 8:30pmET/5:30pmPT on Cooking Channel, Tia Mowry serves up easy-to-make, flavor-packed recipes with a side of entertainment and laughter. As a busy working actress, wife and mom, Tia enjoys balancing her hectic schedule by preparing mouthwatering meals for friends and family. Joining her on the new season Naya Rivera, Wendy Raquel Robinson and Kelly Rowland, plus many more. Whether it is a family reunion dinner, a casual catch up with former castmates, or a great girl’s night in, Tia has the perfect recipe for every occasion. Premiering Sunday, January 8th at 8:30pmET/5:30pmPT- SEASON PREMIERE! “It’s All Relative” Tia Mowry’s aunt and cousin are coming over to share stories about the family’s Caribbean roots while Tia and her husband, Cory, cook up some impressive Caribbean-inspired dishes. Tia and Cory make Tia’s Secret Family Curry Chicken and Potatoes as well as a bountiful Seafood Paella, served with Chili Mango Margarita before a dessert of Coconut Tres Leches Cake. Premiering Sunday, January 15th at 8:30pmET/5:30pmPT “Spicy L.A.” Tia Mowry and her husband, Cory, are hitting the streets of Los Angeles for a spicy adventure. Then, Tia hooks up with her friend Lilly Singh back at home. Tia makes two sets of tacos, vegetarian Roasted Butternut Squash Tacos with Avocado Hummus for Lilly and Blackened Fish Tacos with Avocado Slaw for herself. For dessert, Orange Cardamom Churros served with some Spicy Hot Chocolate. Premiering Sunday, January 22nd at 8:30pmET/5:30pmPT “Game On” Tia Mowry invites her dear friends and The Game co-stars Brittany Daniel and Wendy Raquel Robinson over for some alfresco finger foods! On the menu are Teriyaki Grilled Steak Skewers with Chili Herb Dipping Sauce, BLT Salad Bites, Hot Potato Tots with Chipotle Ketchup and Tomato Pop Micheladas. Premiering Sunday, January 29th at 8:30pmET/5:30pmPT “Dine and Dish” Tia Mowry’s husband, Cory, offers to watch their son, Cree, for the night so that Tia and her fellow mom friend Kelly Rowland can enjoy a girls’ night in. Kelly lends Tia a hand in the kitchen to prepare Chicken Katsu with Spicy Apple Slaw, Cauliflower Fried Rice, Sesame Noodles with Veggies and Spiked Green Tea. More new episodes in February. What do you think? Do you watch Tia Mowry at Home? Will you watch the new episodes? More about: Cooking Channel TV shows: canceled or renewed, Tia Mowry At Home, Tia Mowry At Home: canceled or renewed? Love love love her show! It’s different than the other shows, she’s funny and the recipes use minimal ingredients and are clean eating. I hope her show is renewed for another 5 seasons! YES! My husband and I will be watching. We have been waiting for Tia to return. She is so pleasant to watch. I would like to know where she buys her serving bowls..